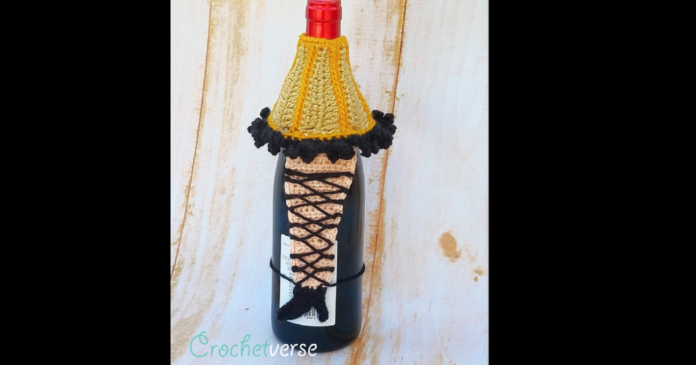 FREE Crochet Leg Lamp Wine Bottle Decor from A Christmas Story! Fra-gee-lay! So, who hasn’t yelled those words after a marathon watching of “The Christmas Story” Movie?? Lord knows, I have. Seriously. One of the best movies of all time. Wine. Seriously. One of the best drinks of all time. SO….for my momma’s birthday gift, I decided to mix them up and here is what I have for you! An adorable embellishment for your wine bottles! Normally, I do not mix Caron Simply Soft and Red Heart Super Saver as I feel they are too different in thickness, but for this project I think it’s fine and poses no issue to the finished project. This will fit most average wine bottles, and instructions are included to adjust if needed. SUCCESS TIP* Do not work your slip stitches overly tight, they will be too difficult to work into the next row if you do. NOTE***To keep this project on the quick side, we will NOT cut the yarn at the color changes. Instead, you will leave it hanging off to the side until it is time to use that color again. When you pick the color back up using it as the final yarn over pull through, be sure to not pull too tightly to avoid puckering the work. Be sure to untangle the colors here and there so you don’t end up with too much hassle, it won’t be much! Less ends to weave. You’re welcome lol! Row 5: ch 1, turn, sl st in each st across, at the final sl st, drop the dark gold and pick up the light gold as previous. 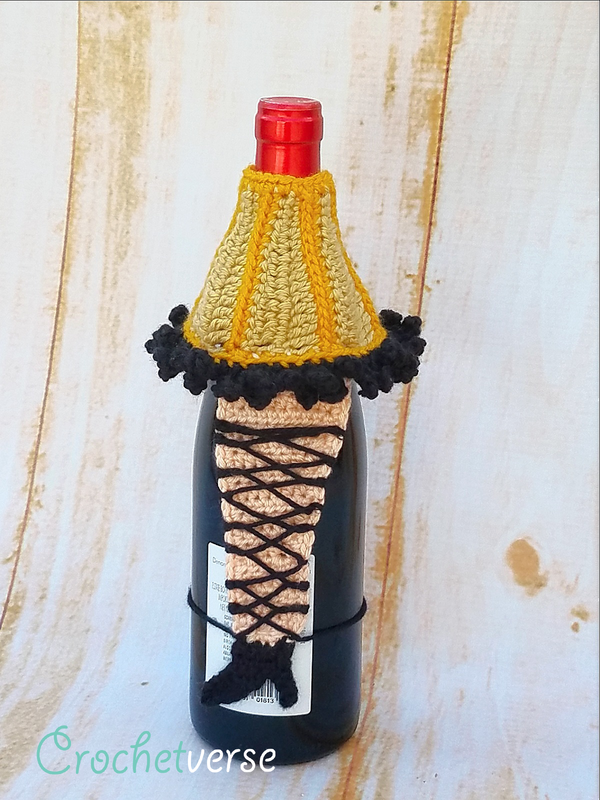 SUCCESS TIP: Before moving along, wrap the piece around the intended wine bottle. If your wine bottle is larger or shaped differently, simple do another repeat or two of ROWS 2-5, then proceed. Rows 22-24: Repeat Rows 2-4, cut the light gold. NOW: Look at both side of the piece, one side has more pronounced dark gold ridges, I prefer this to be the side that shows when on the bottle. Fold your piece so the side you prefer is facing out and the first and last row of dark gold match up. Drop the loop from our last stitch of the row from your hook and insert your hook into the matching bottom stitch on the opposite edge of the piece. Pick that dropped loop back up and pull it through the stitch your hook is inserted through to join the two sides. ch 1 and working through BOTH thicknesses, sl st across the row to close the shade into a circle, do not tie off yet. Rnd 1: (work with the outside/right side of the piece facing you) ch 1, sc around the top opening working around the ends of the rows, sl st to the 1st st made, cut dark gold. 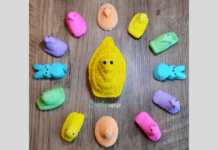 SUCCESS TIP: Work so that you are encompassing the posts of the sts that are at the ends and I also worked around the strands that were carried at the color changes, it really helped make it look neat and clean. It took me 24 evenly space sc to work neatly around as a guide point. Rnd 1: With the outside/right side of the piece facing you and the larger bottom opening further from you, join the dark gold with a sl st around the end of the row where you joined the shade into a circle (row 25), ch 1, sc evenly around working as you did for the top opening edge, sl st to the 1st sc made, cut dark gold. SUCCESS TIP: It took me 42 sc to evenly work around. When working into the tc and ch-3 around the bottom edge DO NOT encompass them completely. 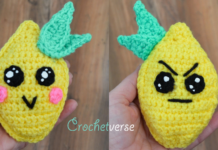 Instead, insert your hook into the strand of the actual stitch only grabbing a side loop or two so that a large gap is not created as you edge! Rnd 1: ch 10, *sl st in next st, ch 10, repeat from * around, sl st to the same st you sl st to at the beginning of this round and cut black. SUCCESS TIP: If you happen to be using Red Heart Super Saver, you may want to make your fringe a ch-8 instead of a ch-10 so it is not overly bulky. Rnd 1: ch 1, turn, sc evenly around working 1 st in the end of each row and st across the top and bottom rows and 3 sc in each corner, sl st to 1st sc made, cut peach. Row 3: ch 5, turn, sc in 2nd ch from hook and nxt 3 chs, sc in the last 4 sts of the row, ch 5. The following are partial rows and don’t work all the way across. Row 4: Turn, sc in 2nd ch from hook and nxt 3 chs, sc in nxt 2 sts of the row, sl st in the nxt st.
Row 5: ch 1, turn, skip the 1st st because that ch-1 counts as the 1st sl st and sl st in the nxt st, hdc in nxt 3 sts, sl st in nxt 2 sts, cut black, leaving about a 12” tail. To “firm” up the show without making it bulky, I use the end tail and whipstiched around the ends of the rows of the shoe, before weaving them in to trim flush. With about a 65” strand of black, begin by pulling the yarn through the stitch on the right of the leg, where the shoe and skin meet, leaving about 12” of tail hanging from the edge, knot it right there at the edge so it is firmly attached. Now, stitch across the leg and wrap the yarn around the edge and to the back then insert the needle from back to front in the stitch of the edge round just a few rows up, stich around the edge stitch 2 times, then move across to the opposite side of the leg a few rows up and do the same. Repeat this all the way until about 3 rows short of the top of the leg, then repeat back down the leg criss crossing over the previous stitches to form a grid. You should end up back down on the opposite side from where you started where the shoe and skin meet. Trim the final tail to about 12” as well. Knot the end of each tail to prevent fraying and trim evenly. You can liken the stitching to the way a shoe lace is criss crossed on a shoe to help you visualize how to stitch it. Using the beginning tail from the leg at row 1, stitch the leg into position under the fringe so it looks like it is coming out of the lamp. I would really love to see what you make! Show me on one of the social media sites linked below! 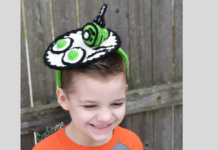 Next articleFREE Leg Lamp Applique – Ugly Sweater?! Ornament?! Stocking?! This is FAB-U-LOUS!!! Thanks k you for sharing! I can’t wait to recreate it for the season! !